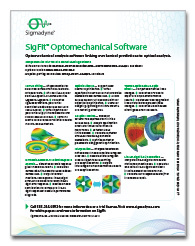 SigFit’s analysis capability can use polynomial fitting to represent in optical analysis deformations of optical surfaces or integrated OPD of transmissive optics. Various forms of polynomials such as standard and fringe Zernike polynomials, X-Y polynomials, and aspheric polynomials can be formatted into files readable by market leading optical analysis tools. Tables of best-fit polynomial coefficients and measures of residual error may be written in various forms convenient for use in reports or subsequent processing. An example polynomial fitting results table using standard Zernike terms is shown below. The polynomial fitting tables show the term coefficients and residual surface error metrics after each polynomial term is subtracted.